The Battle of La Hogue, by Adriaen van Diest. This marked the end of the action, which had been a complete success for the allied fleet; 12 French ships of the line and a number of smaller ships had been destroyed, with minimal English casualties. The action also dashed any hope that James or Louis might have had to mount an invasion that year. Assure yourselves, we will stand by you, and, if it shall please God to give success to our just cause, well let the ancient cavalier party know that they are the only true basis the monarchy can rest upon in Scotland; and we have found such effects of our mercy in times past, as will make us now raise our friends, upon the ruine of our enemys. Unfortunately, James also promised to send 5,000 troops over from Ireland, a decision that required French ships and agreement which he did not have. Instead, on 10 July three French frigates sailed from Carrickfergus with probably fewer than six hundred men, mainly consisting of an Irish infantry regiment, Lords Buchan and Frendraught, along with more than seventy junior officers, all under the command of Cannon. Some of the supplies and men were captured as they took landfall in and around Mull. Dundee, for his part, was on the one hand in despair over James’s meagre reinforcements, yet also conscious that he needed to engage the enemy soon before his Highlanders dispersed. He, Argyll’s forces and those of Scotland’s new commander-in-chief and Dutch brigade veteran General Hugh Mackay, had led a merry dance checking each other’s movements but avoiding a full-scale battle. In fact, Mackay was as anxious as Dundee to join battle soon for fear that Highland Jacobite strength would increase over time. Not all the potential followers gathered. In vain, Dundee wrote a pleading letter to Lord Murray to raise the men of Atholl, although many joined anyway. Cameron of Lochiel was typical of many Highland Jacobites in that he meandered a convoluted path between rebellion and submission to the government, and one of his oldest friends was in fact Colonel John Hill, Williamite commander of Inverlochy, soon to be renamed Fort William, and the garrison was vital to the economy of Lochiel’s clansmen. Nevertheless, he joined with some of his clan at the Battle of Killiecrankie on 27 July 1689, at the pass of that name near Pitlochry in Perthshire, in which action the Highland charge of just over two thousand Jacobites overcame almost four thousand exhausted troops under Mackay. Dundee himself was killed and, of course, became one of the most celebrated heroes of Jacobitism. As for James’s ‘ancient cavaliers’, they were represented by James Seton, earl of Dunfermline, who with Cannon took the victors from the field and commanded instead of ‘Bonnie Dundee’. James enjoyed the victory, but his cause would have been better served if Dundee had survived, he being the most effective Scottish Jacobite commander, given the long illness that Dumbarton had suffered from since his arrival at Saint-Germain in early 1689, and which had seemingly prevented him from going to Ireland. James made two further efforts to bring relief to Cannon’s troops who, in spite of capturing hundreds of Mackay’s men, were hard pressed after their victory. Cannon was no Dundee and was badly mauled on 21 August at Dunkeld by a newly formed Cameronian regiment, the commander falling like Dundee in his hour of victory. Effective leadership of such disparate forces was required. Buchan, who was initially James’s choice to command Cannon’s group but was kept back to help with the siege of Derry, was sent over from Ireland in January 1690 to fill the leadership vacuum, bringing with him a few officers. He was instructed to give the usual assurances from James that further relief would be forthcoming, this time 8,000 men under James’s son the duke of Berwick, then in Ireland with his father. Yet with so few accompanying Buchan, some clansmen began suggesting they submit to the government rather than continue. Many disaffected lowland lords might seek commissions and declare for James, although only if Berwick arrived with a large force. In April, out of necessity, Buchan, Dunfermline and Cannon began raiding in Inverness-shire seeking forage, but then at Cromdale in Strathspey on 1 May, Buchan was convincingly defeated by government forces under Sir Thomas Livingstone. While the senior officers made their escape, an effective Highland rising would never again be possible in the 1690s. Nonetheless, James made one more effort to relieve the clans in Lochaber who were holding out. He despatched Seaforth from Dublin in May, promoting him to marquis and to major general before he departed, but his performance resembled Argyll’s in 1685, moving from place to place, seeking support and achieving very little in the process. On meeting Buchan and hearing of the defeat at Cromdale, Seaforth became dispirited and began to look for means to surrender on terms, acting through his kinsman Tarbat. After reneging on negotiations, he was captured by Mackay and spent most of the next seven years in prison or close confinement. James’s last Highland commission was even less successful than those of Cannon and Buchan. While the Seaforth debacle ended James’s Highland initiatives, this was not an end to Jacobite skirmishing and the general precariousness of the security situation. For the Williamite regime it had, however, become more a policing exercise than suppression of rebellion. Government oppressive measures under Mackay in 1690 now turned to discussion about indemnities in 1691. Tarbat and Colonel Hill had been suggesting since the previous summer that rebellious clans could be bought off. Now Breadalbane’s negotiations with Jacobite leaders for an armistice, leading to the Achallader agreement in June 1691, coupled with William’s agreement to issue a proclamation on 27 August such that pardons would be granted to those who took the oath of allegiance before 1 January 1692, offered an opportunity for the Highland clans to recover from two years of disturbance. As Breadalbane argued to Jacobite intriguers, this was an opportune truce whether or not a Jacobite invasion force was ever to appear. Most Jacobites, however, required James to grant permission to take an oath to William and Mary. Initially, in September James refused permission, but Breadalbane sent an envoy back to make it clear there was no other choice. Late in the day in December, his permission arrived. Some clan chiefs quickly sought competent officers who could tender the oath. It was in these circumstances that the infamous Glencoe Massacre occurred, where on 13 February 1692 government forces slaughtered forty or so Macdonalds of Glencoe, as their chief Alasdair MacIain had been too slow to take the oath. This was a shocking example of ‘murder under trust’ as the Macdonalds had acted as hosts for the soldiers the day before. It was a deliberate attempt by John Dalyrmple, master of Stair, now William’s joint Secretary of State, and other members of the Privy Council to make an example of a lawless clan. The subsequent political scandal was a significant recruiting sergeant for Jacobitism, but also for government opposition in the Scottish Parliament. For his part, James’s initial callous response to the indemnity would seem to have all the hallmarks of Melfort, yet at that time he was still in Rome and James’s secretary was the Englishmen Henry Browne, later Viscount Montagu. The king’s delayed second response seemed justified on the basis that the French were considering a fresh invasion plan in 1691, though this was little comfort to the Macdonalds of Glencoe. James no doubt regarded Highland clansmen somewhat like the Irish, a means to an end. In Scotland these were rarely the ‘ancient cavaliers’, the core adherents of monarchy. Invasion plans came and went until 1697, but in 1692 a firm plan evolved. This was encouraged by the return of Melfort to Saint-Germain in late 1691, and the simultaneous arrival of the ‘Wild Geese’ from Ireland. Louis now had a total of about thirty thousand Irish soldiers and, whereas some of these were fighting in other theatres, the existence of such a force was an obvious signal that an invasion of England or Scotland was credible. In December and January James took time to travel to Brittany to review the troops and to discuss training methods with the officers, and felt a new sense of purpose. In the spring it was agreed by Louis that a force of 30,000 troops would be gathered as an invasion force including 13,000 Irish. Coupled with this, a number of Scottish officers landed at Le Havre in April, having been granted passes by the Edinburgh Privy Council either to remain or go into exile. Among these were Buchan and Cannon, and as soon as they appeared, James ordered them to join the Irish forces with other Scottish officers including Dunfermline and Barclay. All seemed ripe as in Scotland the Glencoe Massacre had badly weakened the government and in England secret communications had been undertaken through Jacobite agents with some of William’s most senior current or former ministers. Re-energised, James was very optimistic and prior to departing for the coast, he held a ceremony at the chapel at Saint-Germain where he awarded the Order of the Garter to Powis, Melfort, and his four-year-old son. He also composed his ‘Advice to his Son’ in case he lost his life in the coming adventure, a work produced in the tradition of princely and fatherly guidance. As it was, the enterprise was bungled for two reasons. Firstly, Melfort drafted an ill-judged declaration which was counterproductive at a time when Tories and Scots cavaliers were needed on side. Melfort’s text showed the more vindictive possibilities of a restoration under James’s Catholic party. Drawing attention to the corruption or hypocrisy of William’s government was fine, but it also stated that those who still opposed James after his invasion would ‘fall unpitied under the severity of our justice’, a tenor that discouraged potential supporters. James approved the text and encouraged its wide circulation in Scotland and England. This certainly confirms that Melfort plugged into James’s natural authoritarianism and aversion to disloyalty. He knew his master too well and was too often a medium, not an advisor. The second failing was blind trust in the latent loyalism of the English establishment which, James believed, just needed an opportunity to return to the fold. Initially the fleet under the French admiral Tourville was damaged by storms which delayed their departure for several weeks. They knew that the combined English and Dutch fleet was positioned off the coast and yet the French Mediterranean fleet was due to arrive imminently. Tourville asked for a delay but this Louis rejected on the basis of James’s assertions, backed up by Melfort, that half the English fleet would desert to his cause. James had been told months before that tentative contact had been made by agents with Admiral Edward Russell, who commanded the Anglo-Dutch fleet, and they were convinced that Russell would turn. Unfortunately, the difference between gripes and real grievance was not understood and Russell did his duty. 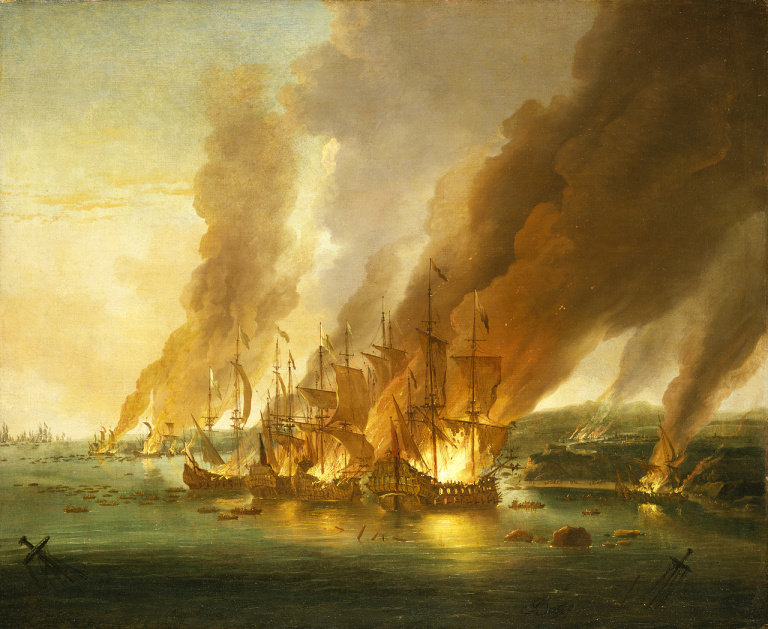 The French fleet was destroyed at the Battle of La Hogue over five days (19–24 May) in what was one of the greatest military defeats to befall the French during the reign of Louis XIV. James watched from the shore and irritated his French hosts by commending the skill and bravery of the English seaman. King Louis, who at the time was besieging the fortress of Namur in the Spanish Netherlands, took the bad news calmly enough, while James made a fulsome apology, reflected on ‘la providence divine’, and entered into a deeper depression about his prospects. All now turned on a restoration in favour of his son, not himself. Back in London, with William in Flanders, James’s daughter Queen Mary took firm action, imprisoning suspected and real Jacobites, such as John Churchill, duke of Marlborough. Middleton and Atholl’s son Charles Murray, earl of Dunmore, two Scots then in London who had plotted a possible rising, were also apprehended. Some marvelled at how Englishmen would have reacted to a force composed of their greatest traditional enemies, the French and the Irish. James’s Scottish end of the 1692 affair was characterised by vagueness and more blind faith. The plan was to send the Scottish officers, about a hundred in total including those who had only just returned from there, back to Scotland to lead a new rebellion. They were to land at the coastal fortresses of Dunnottar or Slains in the North East, and James wrote letters to various lords of Aberdeenshire expecting their willing support. Queensberry and Arran were also written to but they did not stir to further the cause, although the Scottish commander-in-chief Sir Thomas Livingstone and the Privy Council were on alert. Lists of loyal Highland supporters were drawn up. Melfort also penned a declaration for Scotland in April and in this, as in the English equivalent, a number were excluded from indemnity, such as Tweeddale, Melville and Sir John Dalyrmple. Glencoe was rounded upon as an event showing ‘what the usurper will do when he is free of restraint’ but disloyalty would be subject to the gravest penalties and those sentenced in 1688 would get no pardon. This entry was posted in British, France, Wars by MSW. Bookmark the permalink.